The outdoors often translate to all sorts of fun things. From the more traditional ball, bat, and sprinkler, to the more dynamic skateboards, scooters. And of course, the infamous trampoline. While all these gears could, in fact, make the outdoors more fun, your Gold Coast Chiropractor at Hinterland Chiropractic worries that these same gears also make the outdoors significantly more dangerous, especially to your children. Despite being a culprit to thousands and thousands of accidents yearly, trampolines continue to pop up in backyards across the country and around the world. To see an evident proof of its many dangers, all you have to do is turn your television on and tune into just about any television program that features “funny home videos.” Chances are that you would come across a video clip that features someone falling off at the edge of the trampoline. 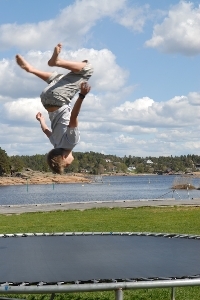 It is alarming to take note of the number of trampoline related injuries that happens every year, especially since most of them are easily preventable. Perhaps more importantly, according to a formidable body of study (Sports Med 2005; 35:685-715), the use of the trampoline directly relates to Central Nervous System injury — or injury of the cervical spine. Once the structural integrity of the spine has been compromised due to injury, it results to a prominent misalignment, known as vertebral subluxation. Vertebral subluxation is a potentially serious spinal anomaly that is known to result to a wide range of unwanted conditions, which include, migraines, headache, neck pain, and low-back pain. Traditionally focuses on correcting vertebral subluxation, chiropractic care is a drug-free and surgery-free approach to healthcare. By ensuring that your spine is always properly aligned and naturally optimizes the connection between your mind and body. Having provided safe and effective chiropractic healthcare to the local Gold Coast community and its surrounding regions for over 2 decades, your Gold Coast Chiropractor at Hinterland Chiropractic offers world-class chiropractic treatment with the cutting-edge chiropractic technology at its disposal. Claim comprehensive chiropractic consultation for only $45 by calling us at 07 5527 3133, or simply by booking an appointment online.